The American Association of Feline Practitioners has just introduced the 2013 Feline Vaccination Advisory Panel Report. Dr. Ford, one of the contributors, shares the highlights and key points of the report. In September 2013, the American Association of Feline Practitioners (AAFP) released an updated version of the Feline Vaccination Advisory Panel (FVAP) Report in a continuing effort to provide guidelines on the selection and use of vaccines for cats. The revised report is currently available at catvets.com (search Guidelines) for no cost. AAFP membership is not a pre-requisite for accessing the report. Legal considerations associated with vaccination. The report includes an Appendix that addresses a series of frequently asked questions appropriate to vaccinating household pets, shelter-housed cats, and cats managed through trap–neuter–release programs. Read Dr. Ford’s Canine Vaccination Guidelines: Key Points for Veterinary Practice (September/October 2012) at todaysveterinarypractice.com. The 2013 AAFP Feline Vaccination Advisory Report reviews recent scientific literature and outlines feline vaccination recommendations suitable for most cats. It must be emphasized that the report is not intended to represent a general protocol for vaccination of all cats; instead, it is intended to guide the development and implementation of safe and effective vaccination protocols. Evaluating varying durations of immunity and safety issues. Lifestyle is a fundamentally important variable in vaccination decisions made for many cats. Vaccination protocols can vary significantly among pet cats within the same practice. For this reason, the report offers specific recommendations based on lifestyle and identifiable risk factors unique to individual cats. With the exception of rabies, the first dose of core vaccine (FPV + FHV-1 + FCV) can be administered as early as 6 weeks of age; then every 3 to 4 weeks until 16 to 20 weeks of age (Table 2), despite manufacturer recommendations to administer 2 initial doses at 9 and 12 weeks of age. The recommendation to administer the last dose in the initial series as late as 16 to 20 weeks of age is based on: (1) ensuring protective immunity at a time of life when risk of exposure to pathogenic viruses is especially high2-5 and (2) minimizing the risk of vaccine interference by maternally derived antibodies. All cats should receive the first booster dose of core vaccines 1 year following completion of the initial series. Key Point: Regardless of the product used, all kittens should receive a final dose of the initial series of core vaccines (FPV + FHV-1 + FCV) at (or as close as feasible to) 16 to 20 weeks of age. Because the report was written for an international audience, and some countries (eg, the United Kingdom) are rabies free and do not permit routine vaccination of household cats, rabies vaccine is listed as noncore. However, for veterinarians practicing in the U.S. and Canada, rabies vaccine should be considered core. A single dose is recommended for all cats at 12 or 16 weeks of age or in accordance with state, provincial, or local law. In locations that do not require rabies vaccination for cats, the FVAP recommends administering a single dose to all cats no less than 12 weeks (3 months) of age. All cats should receive a single dose of rabies vaccine within 1 year following the initial dose, regardless of the cat’s age at the time the initial dose was administered. Both inactivated (adjuvanted) vaccines and a recombinant (non-adjuvanted) rabies vaccine are licensed for use in cats in the U.S. and Canada. At this writing, the recombinant feline rabies vaccine must be administered annually and may be used interchangeably with a 1-year inactivated rabies vaccine. In several states, rabies vaccination for cats is not required. Within these states, however, local (city or county) ordinances may exist. 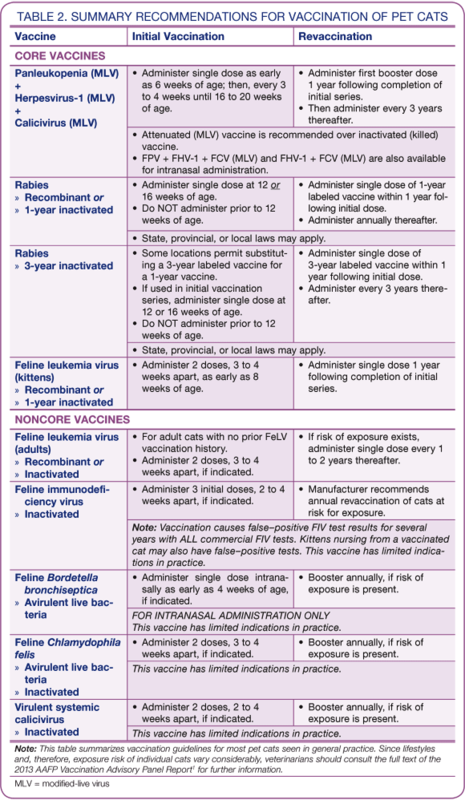 Where no state, provincial, or local ordinance exists, veterinarians are encouraged to recommend rabies vaccination in all cats6; a suggested protocol is outlined in Table 2. Compared to adult cats, kittens have a significantly greater risk for developing progressive disease (clinical illnesses associated with immune suppression and persistent viremia) if infected with FeLV.7-9 Therefore, in addition to FPV, FHV-1, FCV, and rabies, the FVAP recommends that kittens receive 2 doses of FeLV vaccine, 3 to 4 weeks apart, no earlier than 8 weeks of age. A third dose should be administered 1 year following the initial 2-dose series. The FVAP recommends core vaccines (FPV + FHV-1 + FCV) be administered to adult cats at intervals of 3 years. Whether or not core vaccines are administered annually or triennially to adult cats is left to the discretion of the individual clinician. In adult cats, FeLV vaccination is considered to be noncore. Therefore, the decision to continue FeLV vaccination into adult life depends on the lifestyle of the individual cat and assessment of exposure risk. Adult cats at risk for FeLV exposure should be vaccinated with a single dose every 1 to 2 years as long as the risk is sustained. FeLV vaccination is not recommended for adult cats kept strictly indoors. 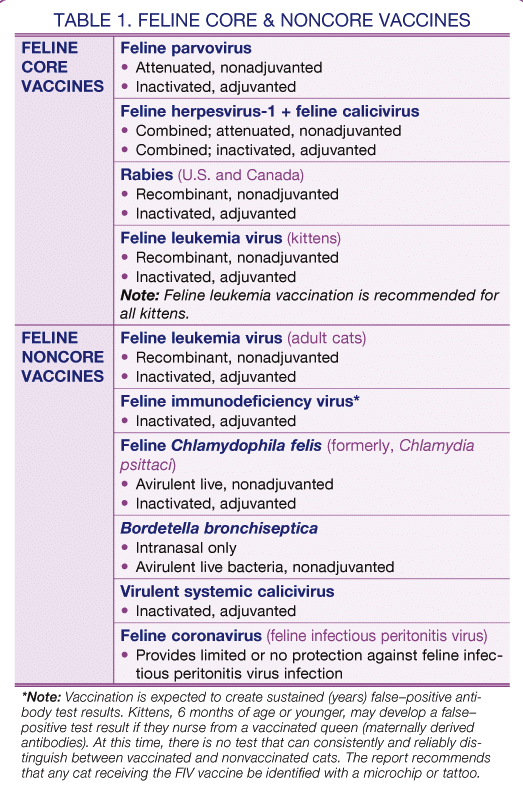 Feline vaccines designated as noncore, or optional, are listed in Table 1. The decision whether to administer a noncore vaccine is at each veterinarian’s discretion but should be based on reasonable assessment of risk for exposure to a pathogenic virus or bacteria. In addition to core vaccine (FPV + FHV-1 + FCV) administration, rabies and FeLV vaccination should be considered for cats of any age that spend a significant amount of time outdoors (unsupervised and not within an enclosure). Strictly indoor cats co-housed with indoor/outdoor cats also have increased risk for exposure; therefore, vaccination against rabies and FeLV for these cats should be considered. Because feline immunodeficiency virus (FIV) vaccination will cause false–positive test results (serology) for several years, all cats receiving this vaccine should be appropriately identified (eg, microchip or tattoo). Note that the FIV vaccine does not provide complete protection from exposure. A vaccinated cat can become infected with FIV and, subsequently, become a long-term shedder. An FIV vaccinated cat can have a true–positive test if it has antibodies and is virally infected. It is generally recommended that cats scheduled for boarding receive a single dose of core vaccines (FPV + FHV-1 + FCV) 7 to 10 days prior to entering a boarding facility if they have not received a booster dose within the previous year. When feasible, kittens scheduled for boarding should receive at least 2 doses of vaccine, with the last dose administered 7 to 10 days prior to entry. The FVAP also recommends that kittens be isolated from the adult cat population at all times if boarding is necessary. It is generally not recommended to vaccinate cats known to be pregnant or lactating. Attenuated FPV vaccine has been linked to cerebellar hypoplasia in kittens from queens vaccinated during pregnancy. In the event vaccination of a pregnant or lactating queen is deemed necessary, an inactivated product should be administered. Regardless of the time elapsed since the last dose of a core vaccine, a single dose of (multivalent) vaccine is generally considered sufficient to boost a healthy cat’s immunity. Duration of immunity following FeLV vaccination of healthy cats has not been extensively studied. While the FVAP recommends revaccination intervals of 1 or 2 years depending on risk, cats 3 or more years overdue for an FeLV booster and considered at risk may benefit from administration of 2 doses, 2 to 4 weeks apart. Generally, cats that are overdue by 2 or more years for a noncore vaccine should receive 2 doses, 2 to 4 weeks apart. Key Point: Because distinguishing indoor/outdoor cats from indoor only cats can be difficult in practice, discrete vaccination recommendations targeting these 2 groups have not been written. However, it should be noted that cats living predominantly indoors (indoor only) should still receive core vaccines at the recommended initial and revaccination intervals. If FeLV or FIV vaccination is recommended to a client, the cat should be tested for FeLV antigen and FIV antibody prior to vaccination. Testing for disease presence prevents future questions regarding how a well vaccinated cat developed an infection. Key Point: There is no benefit associated with administering an FeLV or FIV vaccine to a cat that is, respectively, FeLV or FIV positive. 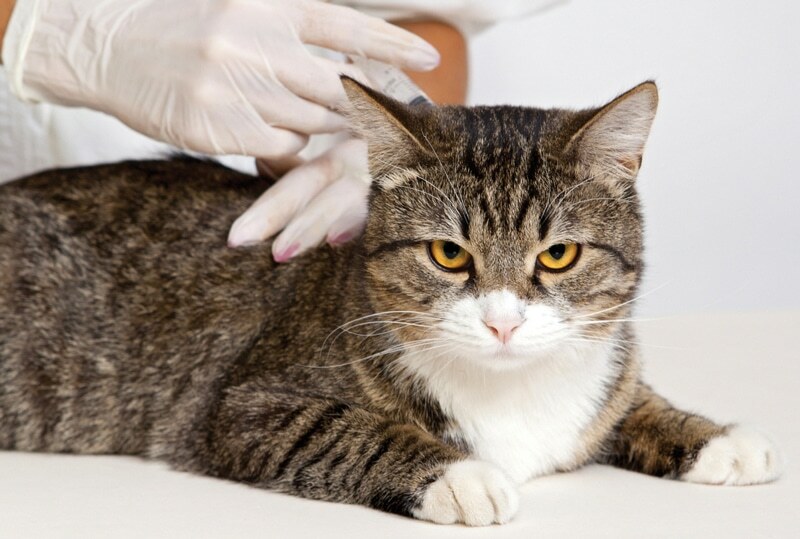 Veterinarians have questioned the rationale of measuring antibody titers in lieu of routine revaccination of adult cats. Antibody titers for FeLV and FIV are not reliable indicators of immunity. Key Point: The FVAP recommends routine revaccination at defined intervals rather than measuring antibody titers to assess immunity. Vaccine adverse events (adverse reactions) are considered rare; however, vaccination cannot be considered risk free. Only limited information is available on the occurrence, type, and frequency of acute-onset reactions in cats following vaccine administration. However, extensive information is available on one of the most serious delayed-onset vaccine reactions—feline injection-site sarcoma (FISS). FISS is a delayed-onset reaction that epitomizes the complexity involved with attributing a serious or fatal disease to a vaccine administered months or years ago. Fact that sarcoma development in cats is not uniquely linked to vaccine administration. Vaccination site recommendations outlined in the report are not based on preventing FISS development. Instead, they allow veterinarians to surgically manage the tumor—by amputation—if a cat develops a sarcoma at a vaccination site. The FVAP recommends that all vaccines be administered subcutaneously (SC), unless mucosal (intranasal) administration is indicated. Although tumor risk is the same between intramuscular and SC vaccine administration, if one develops, it is typically detected earlier in cats vaccinated SC. Rabies: Below the right stifle. *Data have not been published that support these recommendations; therefore, they should not be interpreted as requirements. Also note that licensing studies for parenteral feline vaccines are generally conducted in cats that receive vaccines administered SC in the interscapular region; other administration sites have not been evaluated during vaccine safety and efficacy studies. With the exception of those locations where state, provincial, or local ordinance requires rabies vaccination in cats, veterinarians do have significant discretion in the selection and use of vaccines in cats and are permitted to use professional judgment when making vaccination recommendations. Despite the fact that most manufacturers recommend annual vaccination (per package inserts), veterinarians can use discretion when recommending administration of core vaccines annually or every 3 years. Where feline rabies vaccination is required, veterinarians must adhere to requirements. Current recommendations strongly encourage veterinarians to document vaccine administration in patients’ permanent medical records. The 2013 AAFP Feline Vaccination Advisory Panel Report has been written for the international community of practicing veterinarians. For this reason, note that some of the vaccines referenced are not available in the U.S. or Canada (eg, Microsporum canis [dermatophyte] vaccine). Additionally, categorizing rabies vaccine as noncore is based on the fact that, in rabies free countries (eg, United Kingdom), veterinarians do not administer this vaccine to dogs or cats. Dogs and cats in the U.S., Canada, or Mexico, however, should receive this vaccine as part of their core vaccinations. Scherk MA, Ford RB, Gaskell RM, et al. 2013 AAFP Feline Vaccination Advisory Panel Report. J Fel Med Surg 2013; 15:785-808. Day MJ, Schultz RD. Vaccination. Veterinary Immunology: Principles and Practice. London: Manson Publishing, 2011, pp 192-202. Jakel V, Cussler K, Hanschmann K, et al. Vaccination against feline panleukopenia: Implications from a field study in kittens. BMC Vet Res 2012; 8:62. DiGangi BA, Gray LK, Levy JK, et al. Detection of protective antibody titers against feline panleukopenia virus, feline herpesvirus-1, and feline calicivirus in shelter cats using a point-of-care ELISA. J Feline Med Surg 2011; 13:912-918. Dawson S, Willoughby K, Gaskell RM, et al. A field trial to assess the effect of vaccination against feline herpesvirus, feline calicivirus and feline panleucopenia virus in 6-week-old kittens. J Fel Med Surg 2001; 3:17-22. National Association of State Public Health Veterinarians, Inc. Compendium of animal rabies prevention and control, 2011. MMWR 2011; 60(6):1-20. Hofmann-Lehmann R, Huder JB, Gruber S, et al. Feline leukaemia provirus load during the course of experimental infection and in naturally infected cats. J Gen Virol 2001; 82:1589-1596. Day MJ, Horzinek MC, Schultz RD. WSAVA guidelines for the vaccination of dogs and dats. J Small Anim Pract 2010; 51:338-356. Lutz H, Addie D, Belak S, et al. Feline leukaemia ABCD guidelines on prevention and management. J Fel Med Surg 2009; 11:565-574. Richards JR, Elston TH, Ford RB, et al. The 2006 American Association of Feline Practitioners Feline Vaccine Advisory Panel Report. JAVMA 2006; 229:1405-1441. Tizard I, Ni Y. Use of serologic testing to assess immune status of companion animals. JAVMA 1998; 213:54-60. Schultz RD, Ford RB, Olson J, Scott FW. Titer testing and vaccination: A new look at traditional practices. Vet Med 2002; 97:1-13. Mouzin D, Lorenzen M, Haworth J, King V. Duration of serologic response to three viral antigens in cats. JAVMA 2004; 224:61-66. Moore GE, DeSantis-Kerr AC, Guptill LF, et al. Adverse events after vaccine administration in cats: 2560 cases (2002-2005). JAVMA 2007; 231:94-100. Day MJ. Vaccine side effects: Fact and fiction. Vet Microbiol 2006; 117:51-58. Moore GE, Hogenesch H. Adverse vaccinal events in dogs and cats. Vet Clin North Am Small Anim Pract 2010; 40:393-407. Gaskell R, Gettinby G, Graham S, Skilton D. Veterinary Products Committee working group report on feline and canine vaccination. Vet Rec 2002; 150:126-134. Day MJ, Horzinek MC, Schultz RD. Guidelines for the vaccination of dogs and cats. Compiled by the Vaccination Guidelines Group (VGG) of the World Small Animal Veterinary Association (WSAVA). J Small Anim Pract 2007; 48:528-541. Woodward KN. Origins of injection-site sarcomas in cats: The possible role of chronic inflammation—A review. ISRN Vet Sci 2011; Vol 2011, article ID 210982, doi:10.5402/2011/210982. McEntee M, Page R. Feline vaccine-associated sarcomas. J Vet Intern Med 2001; 15:176-182. Day MJ, Schoon HA, Magnol JP, et al. A kinetic study of histopathological changes in the subcutis of cats injected with non-adjuvanted and adjuvanted multi-component vaccines. Vaccine 2007; 25:4073-4084.